Traveling during the monsoon season in Asia sounds like a bad idea on paper. After all, much of the splendor of exploring a new country happens outdoors, not while being stuck inside the hotel. But the rainy season throughout much of Asia isn't always a showstopper. Afternoon downpours may last only an hour or two. The sun still shines now and then, even during monsoon season. With a little luck, you’ll still get to enjoy plenty of sunny days along with the added bonus of lower prices and less tourists. Merchants and hotels frequently give discounts during the "off" season when they have less business. Asia is affected by different monsoon patterns at different times. 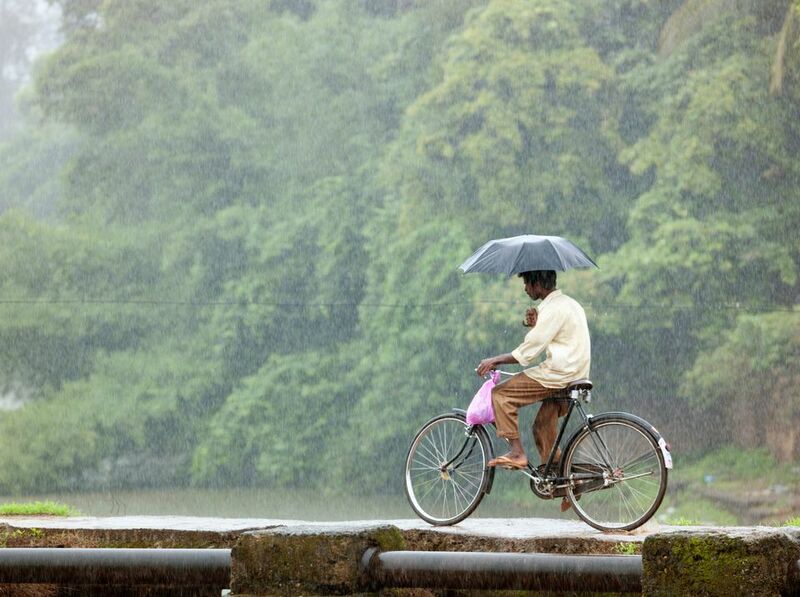 This means that there isn't one simple "rainy season" that blankets the whole of Asia. For instance, while the islands in Thailand are getting plenty of rain in July, Bali is at the peak of dry season. If the prospect of a rainy vacation is too much to consider, choose a destination that isn't dealing with monsoon season, or leave open the option to grab a cheap budget flight and change countries! Does It Rain Every Day During the Rainy Season? Not typically, but there are exceptions. Mother Nature's moods change from year to year. To the frustration of rice farmers, even the start of the monsoon seasons isn't as predictable as it once was. Flooding has become more commonplace in the last decade as weather intensifies and excessive development causes erosion. Pop-up showers in the afternoons can send people scurrying for cover, however, there are often many sunny hours a day to enjoy travel during the monsoon season. Some businesses such as hotels and restaurants are seasonal, particularly in the islands; you may have less choices in each place. Standing water after thunderstorms bolsters the mosquito population, making illnesses such as dengue fever even more of a threat. Outdoor activities and trekking can become difficult or dangerous during the rainy season. Flash floods and mudslides can make trekking more risky. Although scuba diving and snorkeling are still very possible during rain, the time on the boat is far less enjoyable. Unless far enough away, many dive sites will suffer from poor visibility due to sediment and runoff being washed into the sea. Many tours, activities, and chartered transportation options require a minimum number of customers. You may have to pay more or wait longer. Heavy rain can delay or shut down transportation if roads and railways become flooded. Most construction projects and improvements at hotels take place between busy seasons. Early-morning noise and unsightly messes at resorts are a possibility. Although the air may be cleaner, humidity can be suffocating in Southeast Asia after afternoon showers. With less crowds jostling for photos, popular sites and attractions will be more accessible and easier to enjoy. You may have beaches that are ordinarily crammed completely to yourself. Accommodation prices are often cheaper during the low season, and you’ll be able to haggle more easily. Discounts, particularly late in the low season, are easier to find. Obtaining upgrades on accommodation is easier — ask! The air is far cleaner in places such as Sumatra and Northern Thailand where dust and seasonal slash-and-burn fires cause respiratory issues. You may find that staff members are friendlier and have more time to spend with you when not overworked during the peak season. This can open up more opportunities for getting to know a place better. The start and finish of the monsoon seasons certainly aren’t set in stone — and they aren't drastic. Weather generally shifts between seasons slowly with an increasing number of wet or dry days. Arriving at the very beginning of the monsoon season is less ideal because seasonal businesses will have plenty of cash saved up following the high season. The employees are often ready for a break and can be less helpful after an exhausting season. You’ll still have to deal with increased rain but won’t have the same potential for discounts. Arriving in the middle or at the end of the low season is more ideal. Although there is an increased chance for bad weather, business are more willing to work with you. The ideal time to enjoy most destinations is during the "shoulder" seasons, the month before and the month after monsoon season. During these times, there will be less tourists but still plenty of sunshine to enjoy! Hurricane season for the Pacific runs from the start of June to the end of November. During this time, tropical depressions and typhoons coming into Japan and the Philippines can affect weather throughout Southeast Asia for days, maybe even weeks! If you hear of a named storm system coming into your area, plan to hunker down. Tip: Mudslides cause more transportation delays during the monsoon season; additional flights get delayed. Add a buffer day or two — you should have some anyway — into itineraries for unforeseen delays. Throughout most of Southeast Asia, two seasons prevail: hot and wet or hot and dry. Only at higher elevations and in air-conditioned buses will you ever be chilly! Although there is a lot of variance, the monsoon season for Thailand and neighboring countries runs roughly between June and October. During that time, destinations farther to the south such as Malaysia and Indonesia will have drier weather. Some destinations such as Singapore and Kuala Lumpur receive plenty of rainfall throughout the year. Most of the activities you would want to do on an island are outside, but getting wet isn't the only concern. Poor sea conditions can prevent resupply boats and passenger ferries from reaching the islands. Some popular islands shut down for the rainy season and are practically deserted aside from a few year-round residents. Visiting one of these mostly shut down islands during monsoon season is a drastically different experience than visiting during the dry season. Examples of seasonal islands that are popular during peak times but practically shut down for the rainy season are Koh Lanta in Thailand and the Perhentian Islands in Malaysia. Other popular islands such as Langkawi in Malaysia or Koh Tao in Thailand remain open and busy despite poor weather. You'll always have island choices, even during the rainy season. Some islands, even relatively small ones such as Sri Lanka, are divided by two monsoon seasons. Dry season for the beaches in the south of Sri Lanka is from November to April, but the northern part of the island a short distance away receives monsoon rain during those months! Timing for the rainiest months also differs between the two Malaysian states in Borneo. Kuching in the south is driest in the summer, while Kota Kinabalu in the north is driest between January and March. India experiences two monsoon seasons that affect the sizable subcontinent in different ways: the northeast monsoon and the southwest monsoon. Scorching hot weather gives way to heavy rains that can causes flooding. The most rain generally arrives in India between June and October — making traveling during the monsoon season a real test of patience!